Famous for its porticos of the old market where the shopkeepers, tailors, grocers, and shoemakers built their shops, famous in the Massa Carrara district and other places. The castle, built in the second half of the XIV century by the Malaspina family, belonged to Count Noceti. Antonio Da Fave, chronicler of the XV century, rests in its chapel. 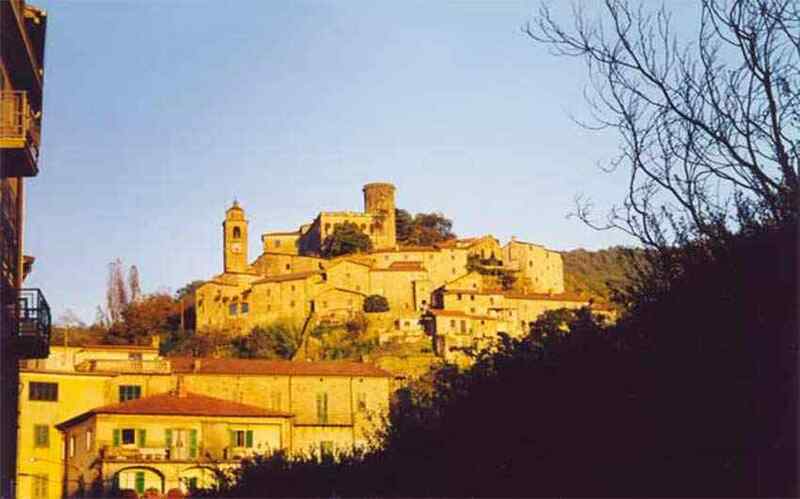 District of Bagnone: Treschietto with the imposing ruins of its castle on the peak of the gorge. Other places are also quite famous: Castiglione del Terziere, headquarters of the Florentine captaincy, completely restored by Loris Jacopo Bononi. Within the greater structure of the present-day Castiglione Castle, the result of layer upon layer of successive accretion, one can clearly recognise the original fortress arranged according to the typical medieval scheme of a central keep surrounded by an outer wall, in this case,with at least one turret guarding its south-eastern flank. Vestiges of the early wall as well as the style of construction, in particular the cylindrical pillar within the four-sided central keep, indicate the fortress was built before the 11th century, that is, in the High Middle Age. In 1351 the Marquis Franceschino Malaspina, dubbed il soldato (the soldier), obtained lordship of the independent fief of Castiglione del Terziere and carried out a significant restructuring of the eastern wing; he had the walls fortified and built the rounded turret still standing today. In 1451 the fief passed under the control of Florence, and Castiglione became the seat of the Capitanato di Giustizia (Captaincy of Justice). Over the ensuing century, the Seigniory and later the Grand Duchy carried out progressive remodelling of the edifices to better adapt them to their new functions as seat of administration and diplomatic relations for those areas of the territory which, though subordinate to Tuscany, were part of the Magra Valley of the Malaspina. Recently, Loris Jacopo Bononi restored the castle to its renaissance splendour. The restoration executed under his guidance has brought to light the splendid details and stylistic elements (marble multiple lancet windows, frescoes and other decorations) of the palace where, for nearly three centuries, the Florentines administered justice in the Lunigiana.The castle now houses the "Centro di Studi Umanistici Nicolò V" (Centre for Humanistic Studies). Founded by Bononi, it boasts an extraordinary library collection specialised in the History of Florence and the Lunigiana, as well as Italian Literature.Over the more than twenty years since theCentre's inception, the castle has become the destination for history scholars and specialists from Italy as well as abroad.